I’ve never been a good dater. And, I’ve never been interested in “playing the field”. My “dating” past before marriage consisted of about 4 long term boyfriends. I must be more of a relationship person than a dater because dating does not come naturally to me whatsoever. Nonetheless, it’s been three years since my divorce and I do have the desire to remarry one day, so dating has to happen, right? Once again, God tells me to trust that He is working and that He will teach me along the way. One thing I’ve learned through my dating experiences is that I’d rather hear crickets than be with the wrong guy after what I’ve been through. Maybe one day I’ll expound on this story, but in short, I’ll just add that I never knew the extent of what human beings are capable of until I went through my divorce and started dating again. It has literally pried my eyes open. Which was shocking, scary, and painful, but God knew I needed to know. Dating is tough personally for multiple reasons. I’m a mom and I work full time, therefore I have limited free time. I want to be an example to my girls. I want to protect my girls. I want to honor God. I want to grow together in a healthy way. I don’t want to get hurt…..who does? I don’t want to hurt others. I also don’t want to settle for anything less than real love. The counterfeit comes off pretty perfect at times. And, I have been fooled before, hook, line and sinker. Because of all this, I pray for discernment and God’s will every single day. I ask Him to expose and remove the deceptions and distractions. I ask Him to cover me in His grace and wisdom and help me to enjoy the process, which is so difficult for me. I ask Him to help me! Another thing I’ve learned is that the perfect man for us will not be perfect, and I can’t expect him to be because I’m not. He’ll have flaws, struggles, and baggage just like I do. But, we will be able to share these struggles with each other because……he’ll be a communicator. We’ll connect. He’ll be a listener. He’ll make me laugh and smile. He’ll be strong enough to handle my sadness and fear when it flares up because…..he’ll be my friend. He’ll love me in spite of my insecurities and my past. He’ll hold me just because he wants to. He’ll encourage my passions and love my love for Jesus. He won’t push me, he’ll relax me. He won’t rush me, but walk alongside me. He’ll know that love is sacrificial. He’ll pursue me. He’ll understand me and appreciate my personal weirdness. He’ll pray for me. He’ll be proud of me and my story. He’ll love the Lord and want to follow Him all the days of his life. He’ll love us so gently and consistently that trust and peace will follow. This may sound like a lot of pressure to put on a man, but I yearn to do the same things for him. To love him well and to love him anyway. Blending two people and two families isn’t easy and I don’t expect it to be. But, I also believe that with the right partner, it can be beneficial and beautiful. 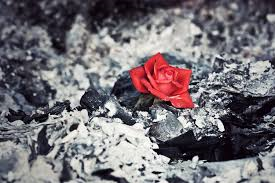 And that’s what God specializes in: Beauty from ashes.